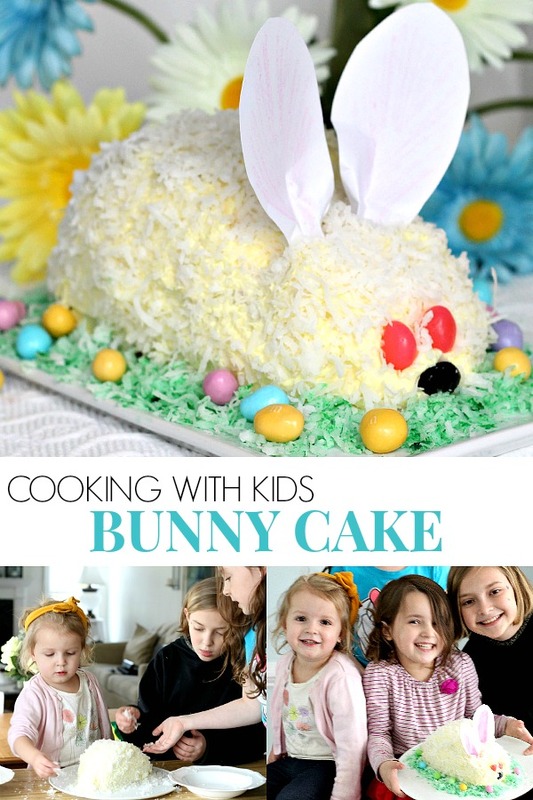 This adorable bunny cake is pretty and a really fun project to do with kids. My little granddaughters did all of the decorating themselves in less than 30 minutes. After baking, I cut the layers in half and stood them up on the cut side after they added some frosting. Then I cut the notches and let them go to town decorating. 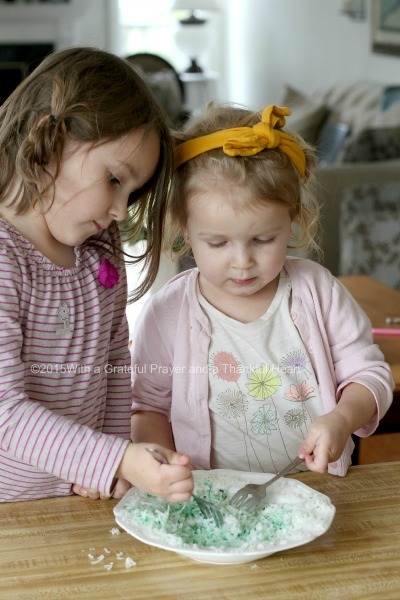 Look how carefully these two worked with the frosting. I thought the tub of vanilla frosting would be white but it was yellow. You probably want to be more careful than I to be sure you pick up a white frosting. 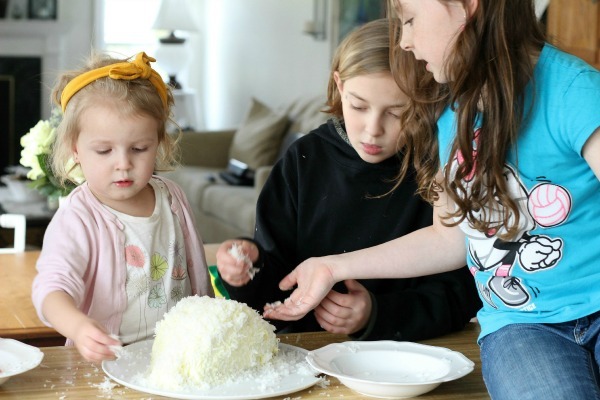 The girls frosted their bunny cake while their older cousin and Pop-Pop worked on a school project together on the sofa. At first our bunny looked like a car without wheels but with a little shaping with the frosting, it took on more of a bunny shape. Carefully patting on the coconut to look like bunny fur. The older girls cut paper ears adding pink before attaching to the bunny. Meanwhile the littler ones tinted the coconut green to resemble grass. I love making memories with our grandkids and they love spending time with their cousins. 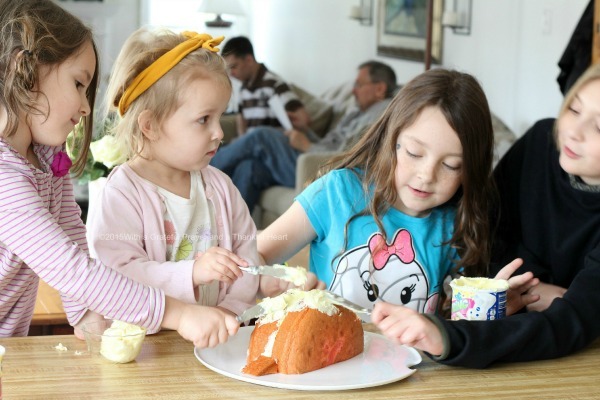 Having an adorable and decorative cake is pretty fun too! 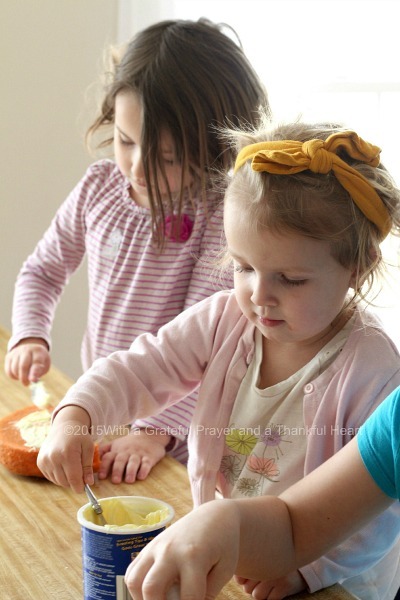 Maybe there is a little one who would love to spend some time in the kitchen with you! 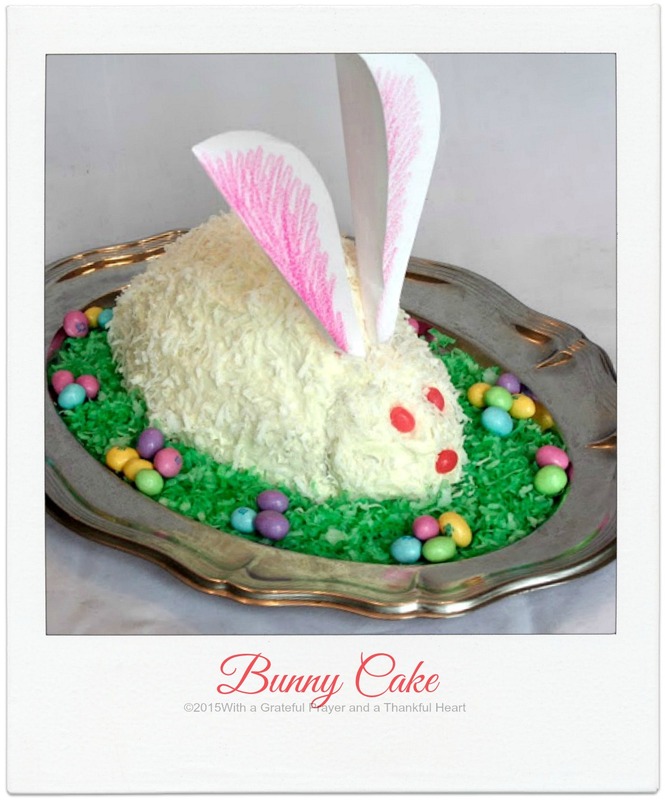 Here is another Bunny Cake I made several years ago. 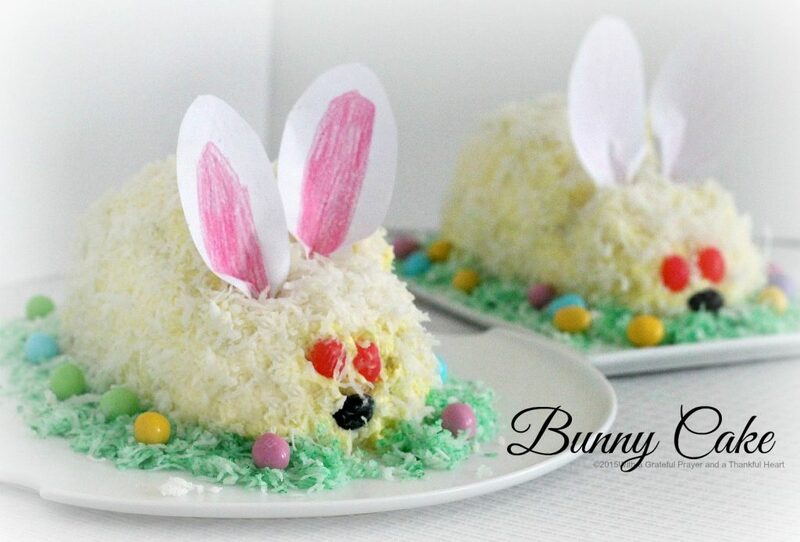 Reserve 1 layer for another use or to make a second bunny. Cut 1 layer in half as shown in diagram. Put halves together with frosting to make body. Place cake upright on cut edge on serving plate. Cut out a notch about one-third of the way up one end of body to form head (small end) as shown in diagram. Attach half of cutout piece from tail with toothpicks. Frost with remaining frosting, rounding body on sides. Sprinkle with 1 cup coconut. 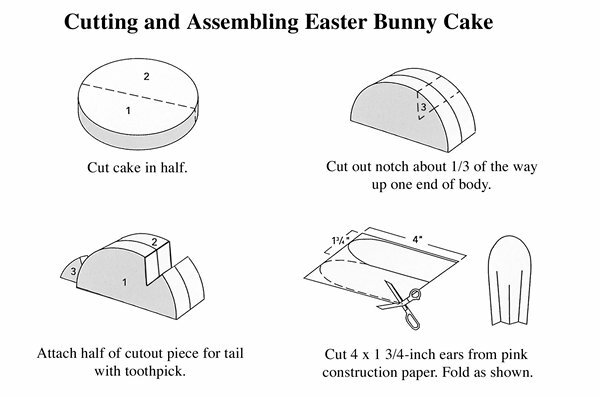 Cut ears from paper; wrap ends that will be inserted into cake with plastic food wrap. Press into notch on top. Use jelly beans for eyes and nose. We baked a strawberry flavor cake in 8-inch pans and used both layers to made two bunny cakes. We used a container of frosting for each cake and about 4 cups of coconut all together. 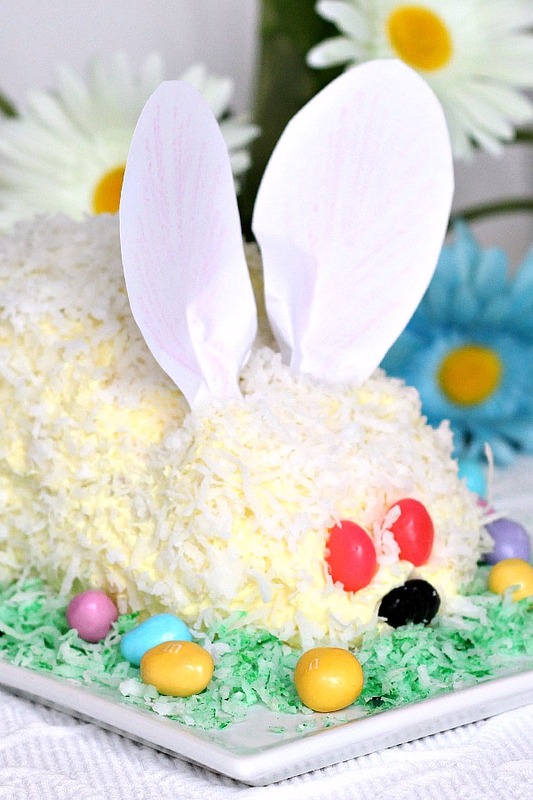 Your bunny cake is adorable. And so nice to have the children help make it. What fun! Thank you for partying with us at Idea Box! What a cute cake and love the inspiration!! 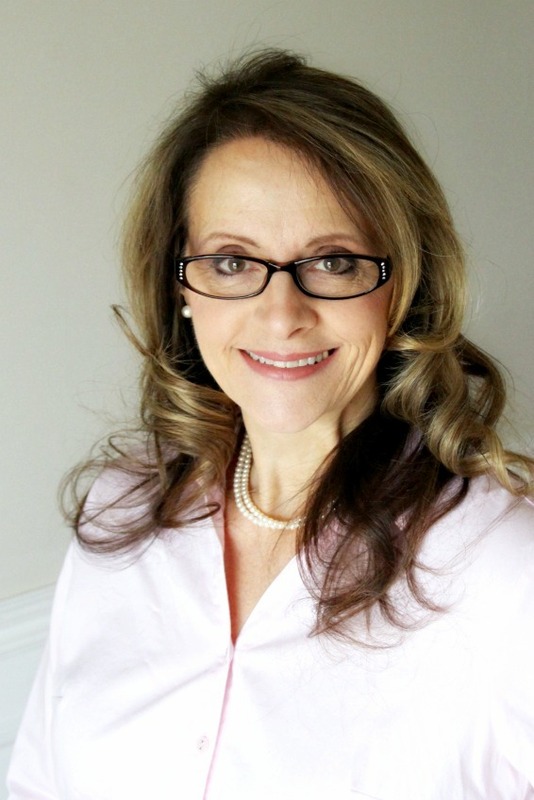 Lorraine…it's just adorable! How much fun are those little ones (and big ones) going to have eating it…or have you already?! Lol! They did such a great job decorating this cake! It looks great! What a great cake and nicely decorated. 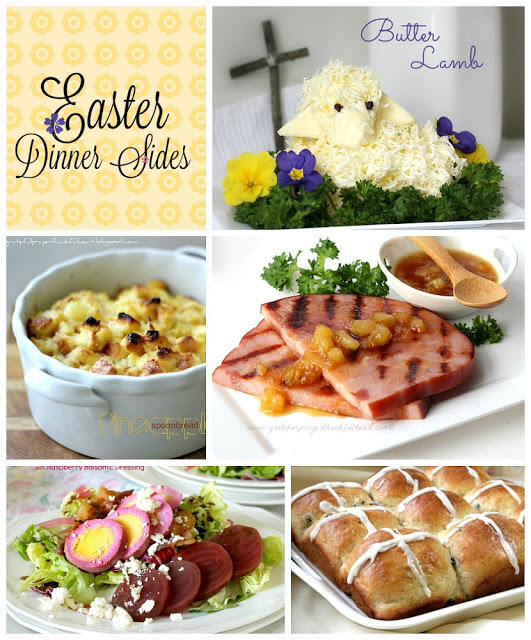 I must make one for Easter. Beautiful job and beautiful granddaughters! That is one great Easter cake! Precious times shared with your sweet granddaughters. Such a cute cake. Blessings to you and yours. 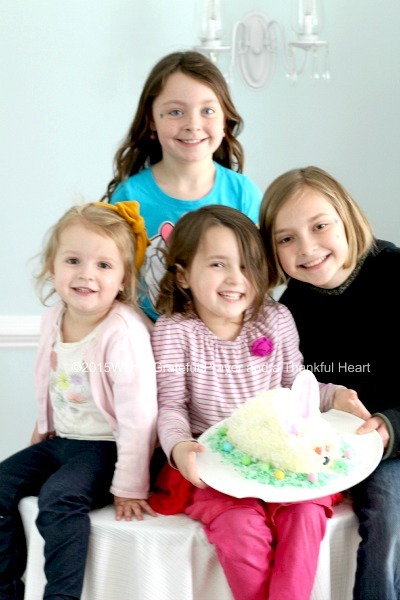 Oh my, what precious grandchildren and that cake is just beautiful! Loving it, it makes me so hoppy to see such a creation! I love seeing the cooperation among the girls. Making memories and traditions – a grandmother's gift. You are teaching them so many things. 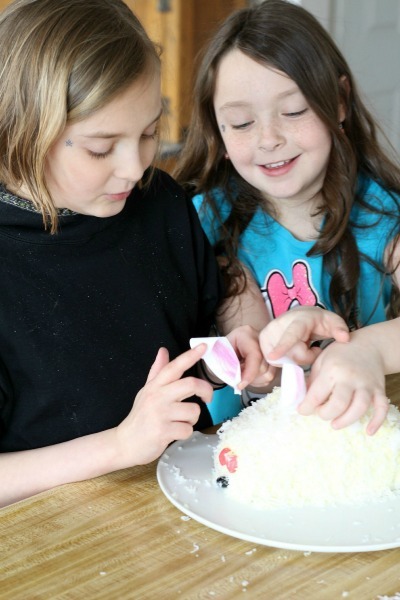 I like seeing their concentration as they do the cake, and I cannot believe how cute the bunny cake is! What a great idea!